Appearance - Armadillos are a unique looking creature and are typically not confused with other animals when seen in daylight. Armadillos have nine or ten horizontal bands that run down its bone casing for flexibility. They have short legs, and long claws for digging. The casing is a very hard and shiny to protect against predators. An armadillo normally runs the same size as a small dog or medium-sized house cat, between 10 to 18 pounds, and varies in shades of gray. Behavior - Armadillo problems usually begin with burrows around your house, flowers in your garden that have been uprooted or munched on. Armadillos are insectivores, and they dig for food in addition to making homes. Armadillos can create around 10-15 burrows within a 10-acre piece of land which could cause damage to your property and housing foundation. These burrows are usually about 8 inches wide and can be up to 14 feet deep. Armadillos are typically nocturnal so seeing these signs occurring during the night might signify an armadillo problem. Armadillos are looking to create burrows for safety and also to allow them to quickly move across your yard with ease--specifically underground. They also dig to find food as well which includes insects, worms, and grubs. While having Armadillos around may seem like a good way to fend off other pests, If your property allows for space and does not have a fence to keep them out, armadillos may take up residence where you do not want them. 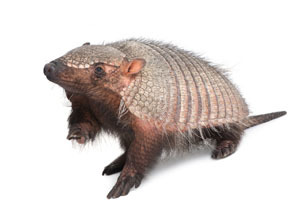 If an armadillo problem is left untreated, you could risk the foundation of your property becoming compromised or cracked sidewalks and driveways from underlying burrows. An unnoticed burrow could lead to injury if accidentally stepped into. Armadillos are also possible carriers of Hansen’s Disease, otherwise known as Leprosy--although the risk of contracting the disease from an armadillo is minimal.